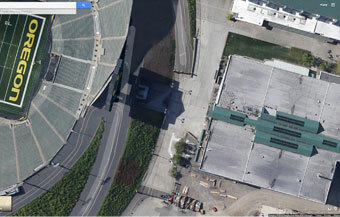 This Saturday as you are kicking back watching college football, when you catch a glimpse of the Oregon Ducks game, be sure to wait for the aerial shot of the stadium and check out the new "wings" at the University of Oregon. Earlier this year our Oregon affiliate, Oregon Commercial Painters (OCP), was contracted by Tube Art to participate in this very cool project in Eugene, Oregon. 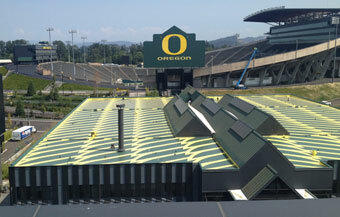 Casanova Center, the Athletic Department Administrative Office Building which houses the Duck's football locker room and weight room is located immediately adjacent to the famous Autzen Stadium, home field of the Oregon Ducks football team. The school wanted to transform the roof of the building by painting its famous wing design across the entire rooftop. It gave OCP a "canvas" of 40,000 square feet. Each painted wing is over 30 feet long. 8-10 guys from OCP completed the project in 30 days. 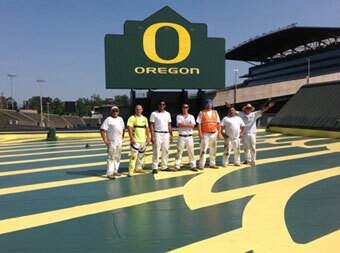 The project required 1,400 gallons of paint in the Ducks' famous green and yellow colors. It was a fun project to be a part of. According to Torrey Hartley, the lead in our Oregon office "The University of Oregon's mantra is 'Win the Day.' Our OCP/TCP/WCP crew 'Won the Year' with their outstanding team work on this project." Turman Focused on Safety Above All. Many contractors talk about safety. At Turman we live it. We train and certify all of our employees in multiple areas relating to safety, and continue to recertify them on an ongoing basis. All of our Senior Field Leaders, and many of our field painters, are OSHA 30 certified. Beyond certification though, we put safe practices to action in the field, from starting the day with a daily job hazard analysis (JHA) and a morning stretching routine, and ending with good housekeeping practices, our crews recognize that field safety is up to them. Our Company's safety program is more than just policies in the Safety Manual, Injury and Illness Prevention Program, Fleet Safety Management Program and others. It is safe practices implemented by our safety team and carried out by our personnel. From the daily practice of stretch and flex and JHA's, to weekly job site safety sweeps and tailgate meetings, to monthly foreman meetings and implementation of the Company Safety Theme of the Month, to quarterly inspections by the Company safety ambassador and annual certifications and Company safety fairs, safety is at the forefront of our work practices. Earlier this year, our Company conducted its annual Safety Fair and lunch for all of its field employees in all of its offices nationwide. 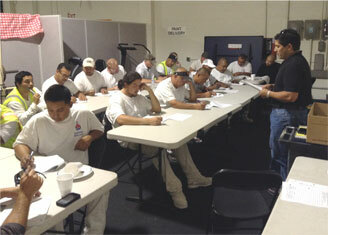 Most offices conducted training in ladder safety, aerial lifts, and respirators. In total, over 100 certifications or renewals were completed in that one day. In addition, guest speakers came in to discuss various safe practices. Because ladders are a big part of what we do, we explored the concept of "Ladders Last." This means employing all other means necessary for reaching our work before employing ladders and only using ladders when other options are not physically an option. In our Livermore office our guys had a chance to view and try out the Company's new lift pod. In order to more efficiently address safety training with a growing workforce in office locations throughout the country, this year we implemented Safety University. We adopted or created training videos for several safety topics including the CLIMB Ladder Academy, Heat Illness, and Globally Harmonized Systems (GHS), among others. Safety University is presented to all new hires within the first 60 days of employment by our safety ambassador as he travels among offices. To further emphasize safety, and reward good behavior rather than simply focus on the absence of incidences, we have several safety incentive programs. We have safety bingo, monthly pizza lunches and a safety sticker program where painters earn Company safety stickers for their hard hats by nomination of their supervisors or project managers and they are entered into a quarterly drawing. 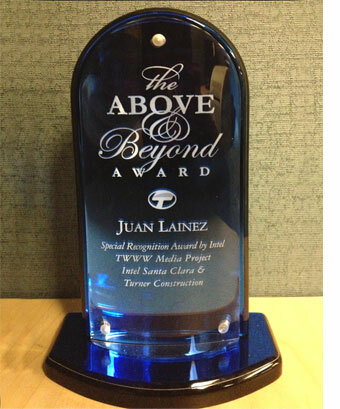 In addition, many of our employees are regularly recognized with an "Above & Beyond" award when project owners or general contractors go out of their way to notify us of our employee's stellar work on a job, which always includes acting safely and without incidences. At Turman, we go the distance to provide a safe working environment because the safety of our employees on our client's jobs is our highest priority. Painting is your chance to show off your skills. Use an edge pad for clean lines around doorframes, ceiling edges and corners so your walls look great - down to every last detail. Slip a small plastic bag over your doorknobs and tape the edge to avoid getting paint in places it wasn't meant to go. If you're looking for paint in high-traffic areas, semi-gloss is the way to go. Shiny and durable, semi-gloss is a parent's best friend. Once an area starts to dry, it's best to leave it alone. Going back over it can leave marks and color streaks in the paint's surface. You've completed your mission to fix every imperfection with patching compound. Now, make sure it's dry. Then sand smooth, prime, and you'll have a surface good enough for any pro.